Researchers identify a previously unknown regulator of the immune system. The immune system not only responds to infections and other potentially problematic abnormalities in the body, it also contains a built-in brake in the form of regulatory T cells. These cells ensure that inflammatory responses don’t get out of hand and do damage. In autoimmune diseases, sometimes T cells don’t act as they should. Now, a new study led by researchers at the University of Pennsylvania has demonstrated how T cells can themselves be regulated hydrogen sulfide, a gas produced by the body’s muscle cells and one often associated with the smell of rotten eggs. The team state that the finding unveils several new possible points for therapeutic intervention, with implications for autoimmune diseases as well as other conditions such as cancer and hypertension. The opensource study is published in the journal Immunity. Previously researchers have thought of signaling pathways as entailing a ligand binding to a receptor. However, gases can also trigger signaling cascades in the body. The best known is nitric oxide, or NO, which regulates a host of functions, notably blood pressure. Carbon monoxide is another so-called ‘gasotransmitter.’ Though less is known about it, researchers have also come to understand that hydrogen sulfide gas plays a suite of important roles in the body as well. Reduced levels of H2S have been associated with immune disorders, cancer and hypertension. It has also been shown that high levels of it are toxic, however, the human body maintains it at a certain level and cells produce it. In an earlier study from the team results showed that mesenchymal stem cells produce and rely on H2S for proper functioning. In the course of that study, they noticed that mice with reduced levels of H2S had problems consistent with autoimmune disease. To see if they could pinpoint the role of the gas in immune regulation, the researchers examined T cells in culture and found that they, too, produce H2S. Mice bred to produce reduced levels of H2S had abnormally low numbers of T cells and, as a result, developed autoimmune disease that affected multiple organs. Giving these mice compounds that release H2S partially alleviated these effects, and the animals lived longer. Next, the lab wanted to find out more about the mechanism by which H2S acted on the immune system. They had already observed that H2S-deficient T cells had lower levels of a T cell marker called Foxp3, however, H2S did not seem to affect the actors of a known pathway by which Foxp3 is produced. So the group hypothesized that H2S might act in another, as-yet-uncharacterized pathway to regulate Foxp3 expression. The current study began to map the pathway. The data findings showed that mice with reduced H2S production had large numbers of methyl groups on the Foxp3 gene, tags which repress the gene’s expression. It was already known that demethylation of Foxp3 can occur through two enzymes called Tet1 and Tet2. However, the results revealed that H2S regulates the expression of Tet1 and Tet2 by modifying a transcription factor called NFYB by adding a sulfur atom to it, a process called sulfhydration. The team showed that reducing H2S levels led to reduced expression of Tet1 and Tet2 in T cells and, consequently, impaired function and development of T cells. The findings proved that they could partially reverse these effects by adding back a source of H2S. The group state that to their knowledge this is the first time anyone has connected sulfhydration with Tet and Tet with Foxp3. The lab conclude that it’s becoming clear that H2S has a very important role to play in immune regulation. For the future the team are continuing to examine how H2S operates in the context of both stem cells and T cells and are looking, too, to see whether it plays critical roles in other cell types. They are also following up on the current work to identify ways to intervene when H2S levels fall in order to prevent autoimmune problems. Regulatory T (Treg) cells are essential for maintenance of immune homeostasis. Here we found that hydrogen sulfide (H2S) was required for Foxp3+ Treg cell differentiation and function and that H2S deficiency led to systemic autoimmune disease. H2S maintained expression of methylcytosine dioxygenases Tet1 and Tet2 by sulfhydrating nuclear transcription factor Y subunit beta (NFYB) to facilitate its binding to Tet1 and Tet2 promoters. Transforming growth factor-β (TGF-β)-activated Smad3 and interleukin-2 (IL-2)-activated Stat5 facilitated Tet1 and Tet2 binding to Foxp3. Tet1 and Tet2 catalyzed conversion of 5-methylcytosine (5mC) to 5-hydroxymethylcytosine (5hmC) in Foxp3 to establish a Treg-cell-specific hypomethylation pattern and stable Foxp3 expression. Consequently, Tet1 and Tet2 deletion led to Foxp3 hypermethylation, impaired Treg cell differentiation and function, and autoimmune disease. 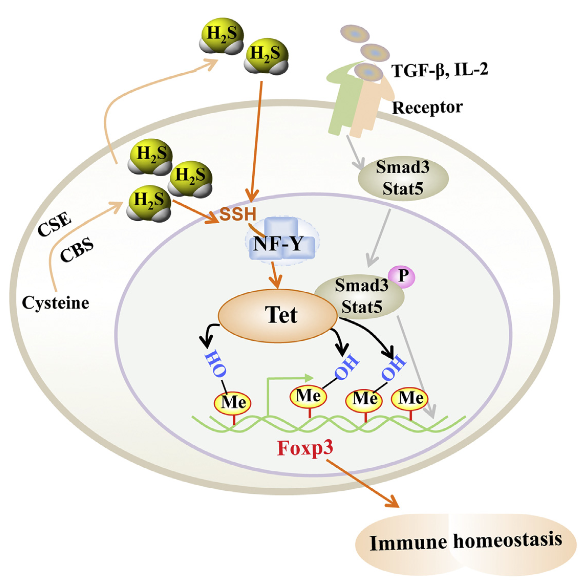 Thus, H2S promotes Tet1 and Tet2 expression, which are recruited to Foxp3 by TGF-β and IL-2 signaling to maintain Foxp3 demethylation and Treg-cell-associated immune homeostasis. Hydrogen Sulfide Promotes Tet1- and Tet2-Mediated Foxp3 Demethylation to Drive Regulatory T Cell Differentiation and Maintain Immune Homeostasis. Shi et al 2015.